Our pricing is designed to help small businesses with high growth potential achieve their PR goals affordably. Save 20% with our annual pricing. For individuals and solo-preneurs just getting started. Our most popular and cost effective plan. For established companies looking for full service PR. 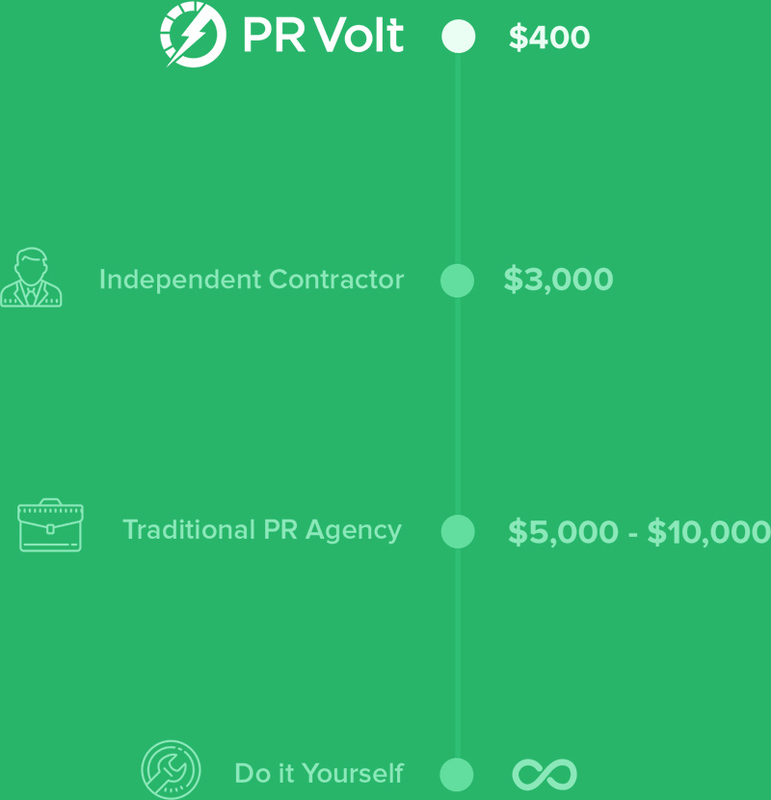 to tailor make your PR program. We'll find your competitors' press and pitch those editors your brand story. We'll monitor Help-A-Reporter-Out and pitch to editors covering your beat. We'll find editors to pitch by monitoring keywords related to your brand. Getting too much interest to handle? No worries, we'll manage it for you. We'll identify influential editors within your geographic target area and pitch those editors your brand story. Need to develop original content? Our skilled team will spin up an article for you in no time. thereafter. With the exception of press releases all add-ons must be part of a monthly account. Can I upgrade, downgrade and cancel any time? Upgrades - yes anytime. For downgrades or cancels - after you have met the minimum commitment period. Our monthly plan requires a 3-month minimum commitment and our annual plan requires a 12-month contract. All of our plans bill immediately after signup. Monthly plans are billed on the monthly anniversary of your sign-up date. Annual plans are billed on your annual anniversary. What happens if I don't get any results? It is very rare that our customers don't see instant results and significant improvement over their current PR program. However, if you see no results in the first 30 days after launching your campaign, we'll give you your money back - guaranteed. We want all of our customers to be happy! If you don't get any results in your first 30 days after launching your campaign, we'll give you your money back - guaranteed. If you have any other problems with the service, please contact our support team. Still Something You Don't See Here? Request your free consultation below and we'll answer all your questions.